Small litters in spotted x spotted crosses? Homozygous and still born pups ? A new spotting mutation in the Mongolian gerbil? Smaller litters in spotted x spotted crosses? On a lot of prominent gerbil websites, they report that breeding two spotted gerbils together will produce smaller litters, because the gerbils that are homozygous (SpSp) never come to exist in the womb. This information is wrong and needs amending. Although the gene is described as pre-natal lethal, this doesn't necessarily mean that it results in smaller litters. In the case of Dominant spotting in the gerbil, the severity of the macrocytic anaemia in the homozygous embryo will cause their demise well before any development takes place and these embryos are simply replaced by new viable embryos. This is why we often see normal sized litters in spotted gerbils. A spotted to spotted mating should NOT result in smaller litters. If you are experiencing this, look to how closely you are breeding your gerbil lines, as even close line breeding can over time, coupled with poor selection, reduce the fertility of the breeding line. In turn, this can cause fewer and smaller litters. So perhaps think along the lines of introducing new blood to your spotted stock, then maybe this could correct the problem. Homozygous and still born pups? On very rare occasions, some breeders have noticed a stillborn pup in spotted litters. Now In theory, SpSp gerbils would be black-eyed white gerbils. However, the abnormality in the development of the neural crest that leads to spotting and slight anaemia in Sp+ gerbils will be far more pronounced in a homozygous individual (SpSp) and the severity of macrocytic anaemia will kill these embryos well before any development can take place. Spotting genes in many domestic species can lead to animals that are homozygous for spotting, but they also tend to suffer from many things such as deformed skulls and jaws, absent or malformed eyes, deafness and severe neurological problems as well. Death occurs at some point in development due to inability to eat, nurse, or through other complications such as megacolon. All of these spotting alleles have a spectrum of lethality, with some individuals dying before birth, some soon after, and sometimes we may see an individual living up to a year. 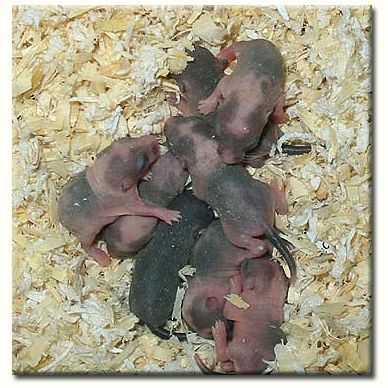 Tests on stillborn pups from spotted x spotted gerbil matings were conducted in 1978 by Alicia Waring, Timothy Poole, and Timothy Perper, where it was noted that even though the dominant spotting mutation they studied fits the data for pre-natal lethal, i.e., a 2 -1 ratio, there were a number of stillborn young found in their SpxSp matings. Because the researchers noticed that both phenotype and breeding data were similar to dominant White spotting (W) and steel loci (Sl) in mice, and that when homozygous, these alleles in the mouse produce Black eyed whites, they decided to test skin samples on these stillborn gerbils under the microscope. This enabled them to check the pigment granules in the developing hair shaft. It was noted that the hair follicles were lacking in any pigment granules, which suggested that had they lived they may have been black eyed white gerbils. In the report it went on to say that the severity of anaemia caused by different spotting mutant alleles determines whether homozygotes die during gestation or live up to a few days, a few weeks or even several months. In heterozygous spotted gerbils, only very slight anaemia is detected, so slight it doesn't affect health, reproduction or longevity. So it seems that homozygous spotted gerbils probably have macrocytic anaemia of such severity that it can cause their demise in the pre-natal condition, and on most occasions, before any development can take place. Although we may argue then that Dominant spotting in gerbils isn't really a true dominant but intermediary, because we shouldn't be seeing black eyed white stillborn pups, we have to realize that dominant is a relative term, as in "X is dominant to Y", and Mendelian genetics is often taught as if genes are simply dominant or recessive. In reality things are far more complex. In the case of dominant spotting, it as an incomplete or semi-dominant in the fact that Sp is only partially dominant over the wild type. In practice however, this matters little to the breeder, as SpSp is most often pre-natal lethal, so the semi-dominant phenotypes appear as a normal dominant. This abnormality in homozygous spotted animals (which are often black eyed white coated animals, or highly depigmented) is a very common occurrence across a wide range of species, and isn't just specific to the Mongolian gerbil. Scientist label the gene that cause spotting in gerbils as Sp, and haven't as yet designated a name to the normal wild-type gene that non-spotted gerbils have. The normal wild gerbil is ++ at the spotting locus, and in contrast, the spotted gerbil is designated as Sp+. So technically it is incorrect labelling a gerbil as Spsp or spsp. However in practice it is easier and makes as much sense to just label a spotted gerbil as Sp and leave the locus blank for a non-spotted gerbil. Personally speaking, I have been breeding good mottled coat colours for nearly a decade and have never had a problem with them health wise. They are perhaps the most placid and well-tempered of all my breeding lines. I do try to stress that the mottled coat colour isn't really a good choice for novice breeders and that a large number of breeding lines are always needed to produce a good mottled gerbil. I find once a particular breeding line has the desired type of coat i.e. an even mottling throughout the coat and replacing the white collar with some mottling, then new blood should be introduced from solid coloured coat lines. These can be in the form of unrelated solid coat gerbils, or gerbils carrying the normal spotting modifiers. I found out that in my own breeding lines that unlike a collared X collared cross, mottled X mottled, very rarely produced the best mottled gerbils, but mottled X mottled modifier, mottled X unrelated solid colour, and mottled modifier X unrelated solid colour, consistently produced mottled gerbils with exceptional, and very well placed markings. The trick is then keeping the mottling nice and even in subsequent generations. Inbreeding need not be used to achieve these ends, but instead rely on a lot more breeding pairs than you would when attempting to improve a normal coat coloured variety. Inbreeding, if practiced, shouldn't be attempted for more than one or two generations before out-crossing, as quite often a lack of good size and a reduction of fertility can easily be the result if your selection proves wrong. Quite often you can get some amazing mottled coats but often these end up on animals with poor type, or small size. When mottled gerbil breeding lines are properly established, the goal shouldn't be for just more and more white, as the unique mottling of the coat will be quickly lost, but rather aim for an even placing of the mottling throughout the coat, with no areas of just pure white. Seeing as the placing of white markings can just as easily be the result of good luck too, inbreeding to fix traits or markings in this coat colour variety can be a moot point and a better result can be achieved with good line breeding and out-crossing to solid lines to introduce further good traits, such as size, temperament, health, or even experimental breeding to a recessive coat colour suspected to have an effect on extending the white markings. Around 2005 gerbils regularly started appearing in Germany and especially in Swiss and Czech stock, that had white in excess of 85 + % on their coat. The base colour of these gerbils are hard to recognize and the colour is expressed in only a few regions of the body (usually ears, back and tail) and they appear greatly diluted. They are referred to as "Extreme white" gerbils. The heterozygous form is known as "White paws" and have extremely pronounced bibs and socks and often a faint head and/or neck spot and a minor belly spot. 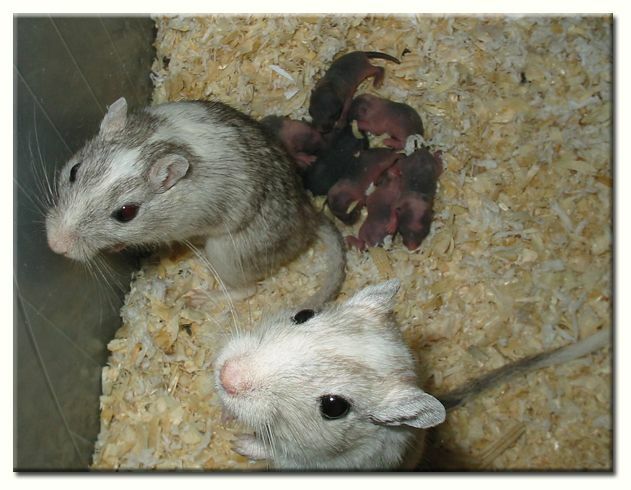 Unlike Dominant spotting in gerbils, the homozygotes are born alive, but die most often at weaning or earlier from megacolon. The mutation is described as being lethal in nature. The extreme white coat colour seems to be produced by the combination of the two spotting genes, the Dominant spot and the new spotting mutation. Even a simple cross with a normal dominant spot gerbil (non-mottled) and the new heterozygous spotting gene will produce extreme white gerbils. Such interactions of two spotting mutations isn't new and was the method first used by the mouse fancy when combining two genetically different types of spotting genes when developing the black eyed white mouse. The extreme white coat colour can be associated with health problems, including deafness, chronically tilted head, and spinning or dancing behaviour similar to waltzing mice. These health problems are known to correlate with ear pigmentation. The gene itself is reminiscent of Ednrb-zero mutations in mice and other domestic species, but closer still to the EDN3 Lethal spotting alleles in mice, and it may turn out that it is feasible only to develop the heterozygous "white paws", and discontinue their breeding lines of Extreme White coat colours. Due to the lethal nature of the new mutation and because it supports the EW pattern, the "Deutscher Rennmauszuchtverein e.V" (German Gerbil Breeders Club) classifies EW and the heterozygous Whitepaws as a problem breed. Breeding of the new spotting gene isn't recommended and existing examples of this breed in the experimental state are not allowed to give out any carriers of the coat colour. The true origin of this mutation remains unclear; as mentioned earlier, the Lethal Black-Eyed White, Extreme White and White Paws can be tracked down to around 2002 in Germany. My own theory of this possible new gene appearing is that after a second introduction of wild Mongolian gerbils arrived in Western Europe around 1995 to the Leibnitz institute for study, many breeders used wild type Mongolian gerbils and spotted lines were often out-crossed to wild types to strengthen their stock. This was needed as many of the spotted varieties had been extensively inbred in an attempt to achieve a mottled type coat colour. Many wild type gerbil species have been well documented as often exhibit minor spotting variants, these include Shaws, Tristrams, Sundevall jirds, Bushy-Tail jirds and even Pallid gerbils. So it's not unlikely that some form of spotting may have existed within this new population of Mongolian gerbils, which was dissimilar from Dominant spotting, but readily co-operates with it and it may have been possibly introduced via this route. White spotting in the Mongolian gerbil. Waring, A.D., Poole, T.W. & Perper, T. 1978. The Journal of Heredity, 69, 347-349. Elizabeth S. Russell and Seldon E. Bernstein-Blood and Blood Formation-In Biology of the Laboratory Mouse. E.L. Green, Ed. Second edition. McGraw-Hill Book Company, New York. 1966. Examples of the the Rumpblack & Lethal Black-Eyed White coat phenotypes, can be seen on the Extreme white spotting galleries. Click here to view the Extreme White coat colour gallery 1. Click here to view the Extreme White coat colour gallery 2. A New Spotting Mutation in Mongolian Gerbils ?